I am a firm believer in Samin Nosrat's ideology that any meal can be made extraordinary with the correct balance of salt, fat and acid. Especially salt. I usually add more salt than any given recipe calls for. A little bit about me, I live in the San Francisco Bay Area and love calling it home. Before that I lived Oregon, New Jersey, Missouri and Louisiana. It is a little difficult for me to answer "Where I am from" questions since I have moved around so much in my life. My parents cooked a lot growing up and had a big influence on my palate. My dad was more of a French-inspired fancy home cook and my mother, being from New Orleans, fed us some of the best Southern food I have ever had. I live with my husband Mike, who works in the beer and cider industry. This is our nine year old rescue mix Malcolm. 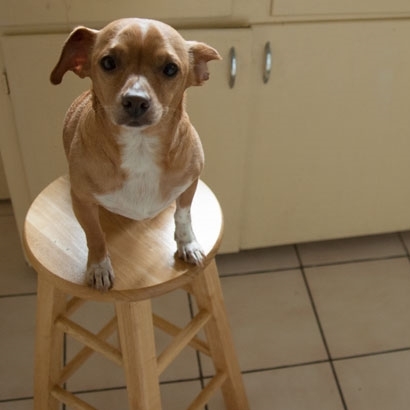 For the record, he was not thrilled about sitting on this stool.